Why do I Like This Product? I cannot rant or rave enough about this product, it is truly my favorite setting spray right now and I don’t think I will ever stop using it because it works SO well. Initially when I saw this product for the first time I thought “I don’t know if this is going to work that well,” because I’ve tried my share of setting sprays and had little success. Perhaps my expectations were too high, but this product meets them without lowering the bar! I have super oily skin. Usually by the end of the day I have retouched my makeup two or three times! 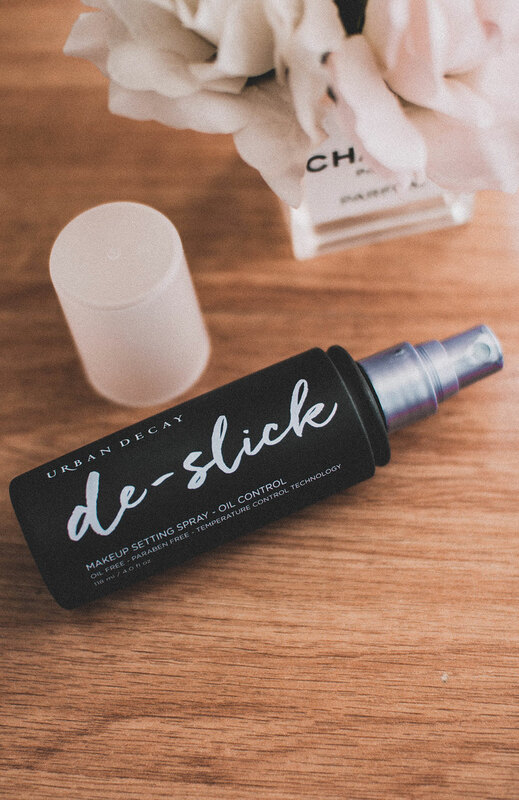 This setting spray made my makeup stay all day long. ALL DAY! What is amazing about this product is that it does not feel heavy. I’m not sure about you, but there are some setting sprays that I have used that made my face feel hard, and heavy. Like when your face seems sticky or stiff when you’re moving your eyebrows, eyes, and talking? This is not like that, it feels good as if I weren’t wearing much makeup. What isn’t there to love about that! 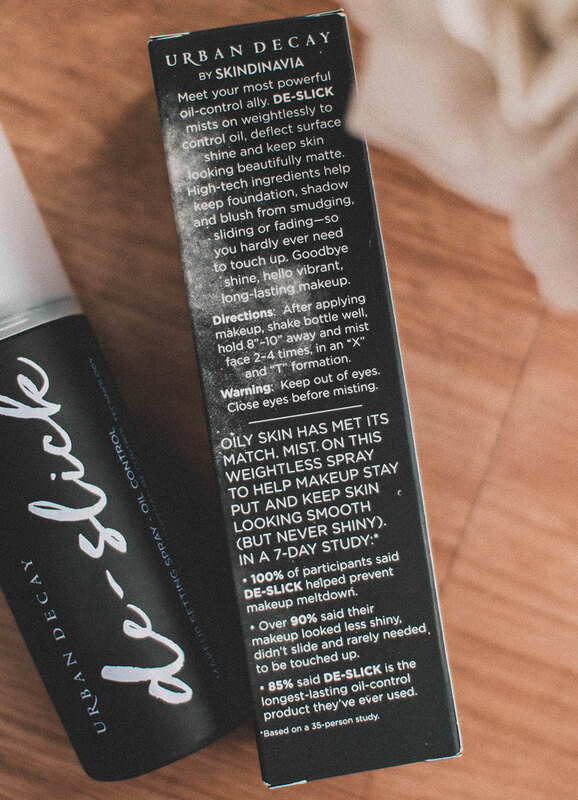 So De-Slick Oil-Control Makeup Setting spray comes in two sizes: a standard 4 ounce and a mini 1 ounce. Urban Decay does not test their makeup on animals, and has been (and continues to be) cruelty-free. Unlike similar products on the market that feel sticky or tight on your skin, the sprayer delivers a microfine mist that goes on so light, you’ll hardly feel it—and once you’ve applied it, you won’t even know it’s there. I feel as if I do not need to explain how to use setting spray, but it simply is a mist you spray over your face after you have completed your makeup. Shake the container well, hold it about 8″-10″ away from your face and mist in an “X” and “T” formation. 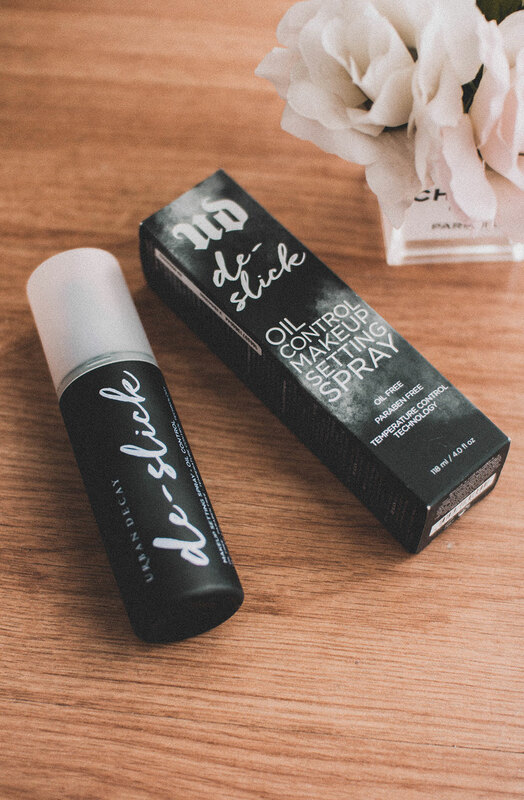 Depending on how oily your skin is, you may need to do it two to four times, per Urban Decay’s instructions. Allow it to dry, and look amazing for the rest of the day without worrying your face will look like it is melting! Something I do, which is maybe a weird way of applying setting spray, helps make my makeup last longer than usual! When I am doing it I apply all of my foundation, concealer, powder first. Once I finish these steps I spray one layer of setting spray- this is BEFORE anything else on my face. Afterwards, I do my shadow, blush, highlighter, anything else, and then one more layer of setting spray. Make sure it dries well before continuing, that way it holds your makeup longer. It seems like extra work, but if your skin is oily like mine this is the trick to do to keep your makeup lasting all day! Overall, this is an awesome product- especially for oily skin! I don’t think I will ever stop using this product because it works so well. If you have oily skin, if you want to try a different setting spray because the one you are using is not working, you should try this one. I gave it a try and I love it!